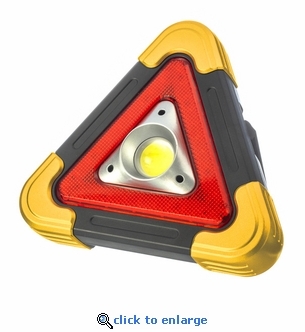 This multi-function COB LED triangle safety warning and work light creates a flashing alert to keep you safe during a roadside breakdown or to attract help. This flashing emergency warning light is a great addition to vehicle emergency kits or survival kits. Stay safe during roadside emergencies or tire changes by alerting other vehicles. Whether boating, hiking, backpacking, hunting or camping, this emergency warning and work light is an emergency essential. Size: 6.5" x 7.25" x 1.75"